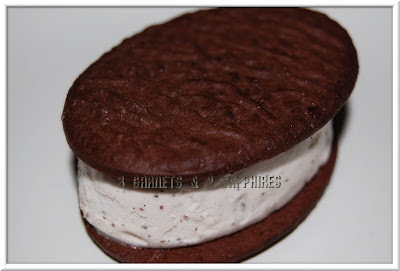 We have had such great success in our household with switching from not-so-good-for-you to better-for-you treats and snacks that I had no doubt that these new Smooth & Dreamy Ice Cream Sandwiches would get the seal of approval from my children. After trying the Vanilla Fudge Brownie Sandwiches, I was proven right. If you can believe it, the biggest fan of ice cream sandwiches in our house is not one of my children, but rather my husband. He was the one we really needed to please. Even though neither I nor the children could tell the difference between these and other ice cream sandwiches we have eaten in the past, my husband's opinion was that these Breyers Smooth & Dreamy ice cream sandwiches were of very high quality and tasted as good as a low calorie ice cream sandwich could possibly taste. Still, I think they did not successfully offer him the level of decadence he seeks when having an ice cream treat. To view the full line of Breyers Smooth & Dreamy ice cream products, visit SmoothAndDreamy.com . While you're there, play the Wheel of Delights Instant Win & Sweepstakes for your chance to win $10,000 or some great daily prizes. I wrote this review while participating in a blog tour campaign by Mom Central on behalf of Breyers and received products necessary to facilitate my review and to host this contest. In addition, I received a gift certificate to thank me for taking the time to participate. One lucky reader will receive 5 vouchers for free Smooth & Dreamy Ice Cream treats (each worth up to $6). 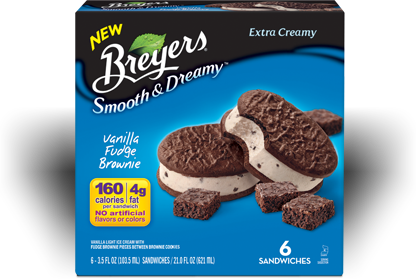 Browse the selection of Smooth & Dreamy Bars and Sandwiches offered by Breyers. Then leave a comment telling me the name of product you would like to try the most. You MUST do this to be eligible to win this contest. 3) For 10 extra entries, blog about this contest linking back to this post AND SmoothAndDreamy.com . Then come back here and leave TEN separate comments with the link to your blog post. 5) For 1 extra entry each, follow Breyers on Twitter and/or "Like" Breyers on Facebook. Then leave a separate comment for each with the link to your Twitter or Facebook profile. This contest will be closed on Monday, August 16th, 2010 at 11:59pm EST. A random number drawing will be held shortly after. The winner will be announced here and will be contact via email or through their blog. If the winner does not respond within 48 hours, a new number will be drawn.